For British people of my generation, who are perhaps not as educated as they should be, Gdansk doesn’t sound like an appealing destination. When I was growing up, Poland was under martial law and the name Gdansk still makes me think of meat shortages, Lech Wałęsa, shipyards and grey concrete. If you also think that way, you‘d be very wrong. 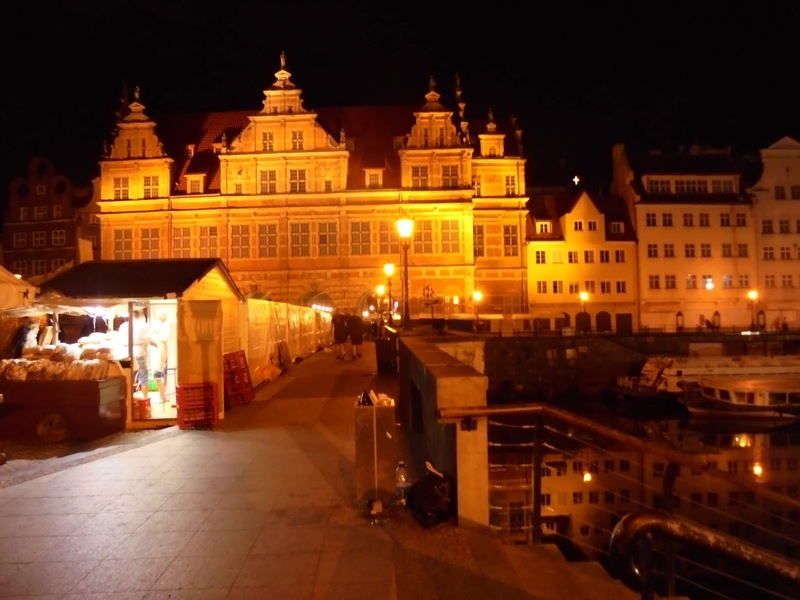 It helps to realise that Gdansk was formerly known as Danzig and one of the most important ports in the Hanseatic League of medieval Europe. This is Ulica Piwna in Gdansk. In the past when the town was predominantly German, the street was called Jopengasse. Both names redolent with beery history, for Jopengasse is named after the legendary Danziger Jopenbier (or perhaps the beer is named after the street), whereas Piwna literally means Beer Street. There are a few other beery addresses. 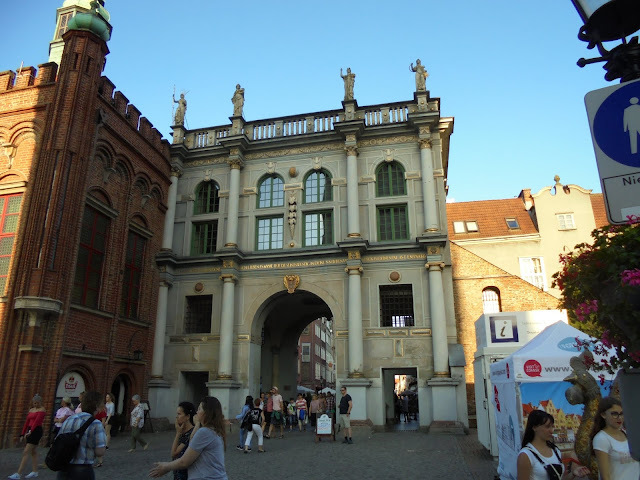 As well as Jopengasse, Danzig in the 19th century also had a Mälzergasse, maltsters’ street. 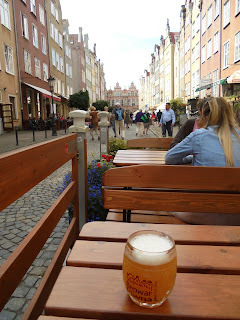 The street then called Hinter Adlers Brauhaus, “Behind Adler’s Brewery” is now called Browarna, brewery street and the one-time Hopfengasse is now Chmielna, both meaning Hop Lane. The grand building at the end of the street is the old town arsenal. Of course, these days there is a bar in there selling New England IPA and milk stout. No, really, there is. After visiting the Solidarity museum in the former Lenin Shipyard (where you can see Lech Wałęsa’s jumper) I do need a beer. Happily, there is still beer brewed in Beer Street. Browar Piwna, which I suppose you would need to translate as “Beer St Brewery” rather than the decidedly redundant sounding “Beer Brewery” is a bit touristy, as you might expect. But the beer is good. Their Pils is as murky as the soupiest IPA, but tastes entirely different, with that fresh lagering-tank CO2 you find in good brewpub beer. Hops build to a substantial bitterness. If you gave this to me blind I’d call it some sort of Kellerbier rather than Pils, but whatever. 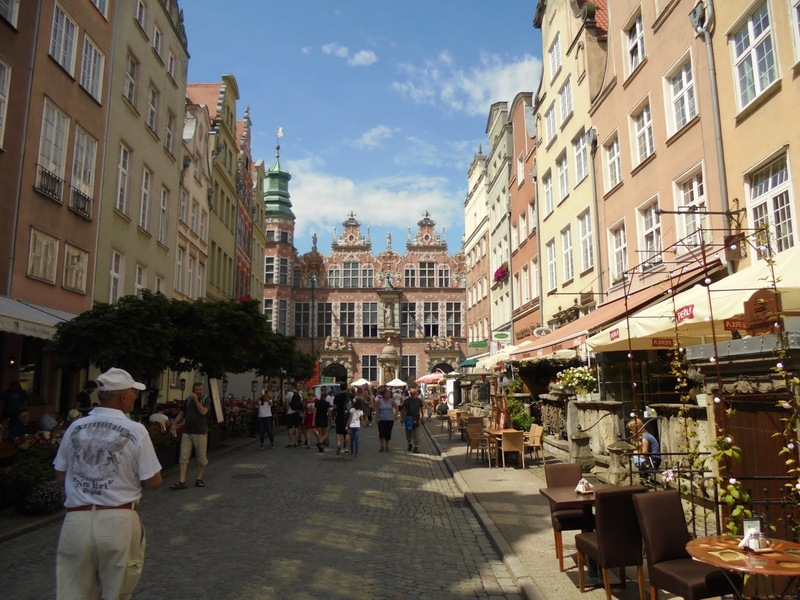 Gdansk and the neighbouring towns of Sopot and Gdynia make up a conurbation known locally as the Trójmiasto, Tri-city. 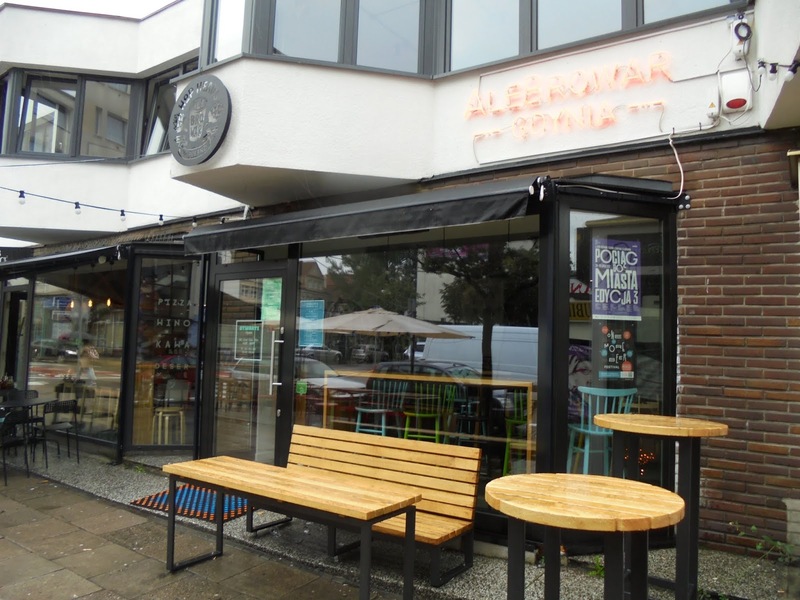 Sopot is the smallest of the three but it has two brewpubs. In Browar Miejski Sopot we have a very nice oatmeal stout (12º, 4.7%), very smooth and creamy with no rough edges with notes of liquorice and smoke. An “American Red” beer is straightforward, a little watery but not bad. The standout beer, though, is the Pils: fresh malt and just the right amount of diacetyl for me. Low, cask-like carbonation and lovely, perfumey hops with a fresh edge to them. Perhaps not bitter enough to be a true Pils but whatever it is, it’s a very nice beer. A day drinking in Gdynia sees us start – I can’t remember exactly why – at Blues Club. As everywhere else, the big brewers are attempting to capture a share of the speciality market. 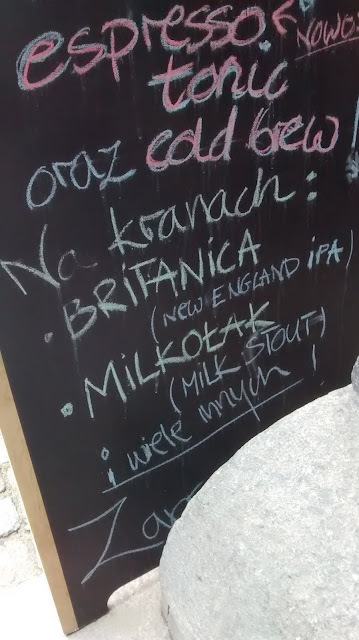 They are pretty keen on witbier and Zywiec Bialy is a very light, bland but drinkable specimen. Toasty malt, creamy mouthfeel, needs more coriander. There is fancier beer in bottles in the fridge. 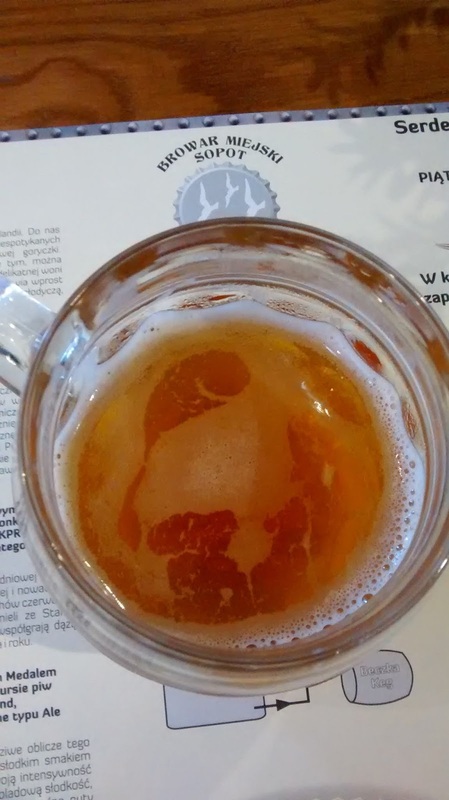 The double IPA and Porter from Browar Zamkowy Cieszyn look interesting so we order those. They come in 50cl bottles and are 8.0% and 9.8% respectively, and it’s only lunchtime. Woops. 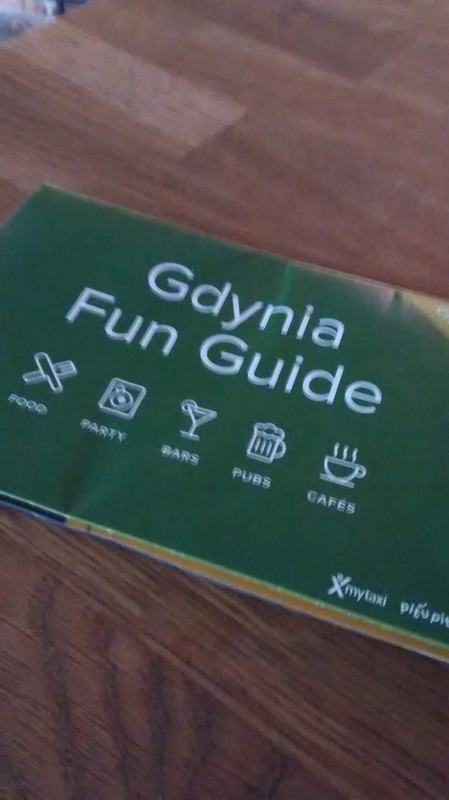 It is a nice enough bar and at least there is a Fun Guide. The double IPA is surprisingly light in body with savoury, spicy aromas and a slightly odd meatiness. Needs more hops but the bitterness builds gradually. A fairly decent West Coast IPA actually. The porter was apparently so good there are no notes. We then have a further vanilla and chilli stout at 6.4%, made with a traditional (hmmmm) decoction mash, It’s very nice, sweetish with oaty creaminess, breakfast-cereal malt and a very subtle chilli burn – the vanilla is not apparent. We need pizza before the next beer and fortunately there is a pizzeria right next door to our next stop. The pizza dough is yeasty and not salty enough, which is a shame because the toppings are outstanding. 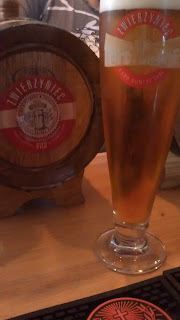 To go with it, Łomża Export is one of those Polish pale lagers: sweetish but with a prominent balancing bitterness. OK. For 9 PLN (about £2) more than OK.
Next door is the tap of the “craft” brewery AleBrowar. It looks like every other craft beer bar everywhere, but with more Zs and Ws. We start with a beer called “Be Like Mitch”. If more brewers were like Mitch, the world would be a better place. Fruity pineapple, clean bitterness, drinkable, not too extreme. “King of Hop” is excellent too: really good hop nose, intensely dank and bitter. 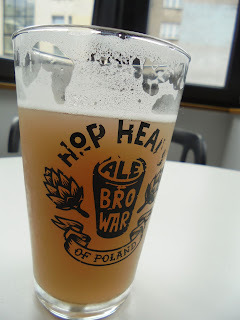 AleBrowar is perhaps best known for its IPA Rowing Jack, once called Poland’s best beer by Hector, who visits a lot (although the last time I spoke to him he’d since found a new favourite). I find it nice enough but not as outstanding as I’d been led to believe. The classical profile of caramel malt and resin is there, with a certain mintyness and a little diacetyl, so the end effect is a bit like drinking mint Werther’s Originals (is there even such a variety?). Jesus Juice is their murky. It’s very unattractive pond water and the closest I’ve ever seen to a beer that was actually grey. The flavour is the usual Lilt with hops. Meh for this one. A milk stout called “Sweet Cow” has a really weird smoke and mushrooms aroma and has to be swapped for a beer called “Roo Juice”. This has a really nice dank aroma with jasmine tea notes, dry and astringent. It is basically best bitter and one of the best on offer today. At the end of my notes I have written that AleBrowar is the Polish equivalent of Sadler’s, but have no idea what I meant by that. 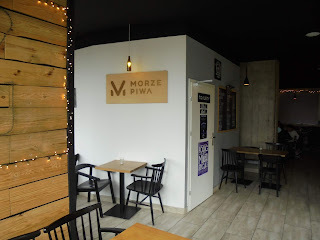 On to the next beer place, Morze Piwa Multitap, an oddly draughty place with the atmosphere of a theatre foyer. Ziemia Obiecana Mini Dzordz, a “session New England IPA”, could be a nice glass of pineapple juice but is ruined by a strong, unpleasant flavour of burnt rubber. Przystanck Tiesi Kölsch also has a slight burnt rubber nose and a bit of marzipan, but otherwise is a surprisingly competent attempt at a Kölsch. We don’t stay here for another. Our last stop before jumping back on the train is Beczka Chmielu, an empty beer bar where draught beers on offer are less fancy and perhaps that’s just as well. Zwiemyniec Pils is an OK lager but again lacking in hop flavour and aroma. But at least it has a head on it. Staropolski Porter Baltycki is 10.2% and full of liquorice flavour, nice and rather reminiscent of Courage Russian Stout. The beer culture here has been gratifyingly good. “Craft” beer has been faster to make headway in Poland than in Germany, perhaps because there is more of a blank slate. Polish industrial pale lager is pretty grim, not quite as dull as British standard lager but notably worse than the big German brands. I was not expecting to find historic Polish beers such as Grodziskie or Jopenbier, at least not easily, and I didn’t. I did encounter an isolated bottle of Grodziskie, of all places, in the railway station shop in Sopot. At the moment, caught between the oceans of pale lager and IPA, the strong Polish porter is still the most distinctively Polish feature of the beer market here. I will look out for any of these whenever I see them. But the revivalists are making progress. 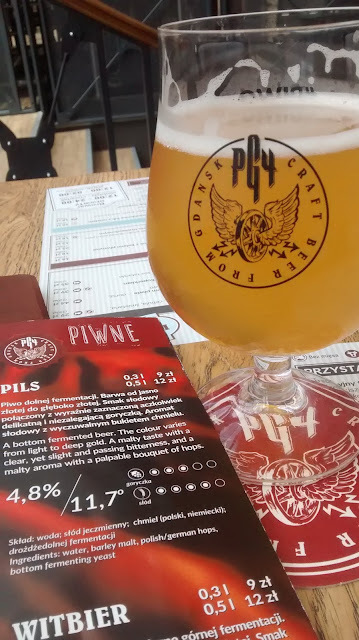 Our last stop is back in Gdansk at the relatively new brewpub PG4, right next to the railway station. If AleBrowar is unabashedly American-influenced, PG4 is surprisingly German. I didn’t know it at the time, but the head brewer and the brew kit both come from Germany, which explains the beers they make here. 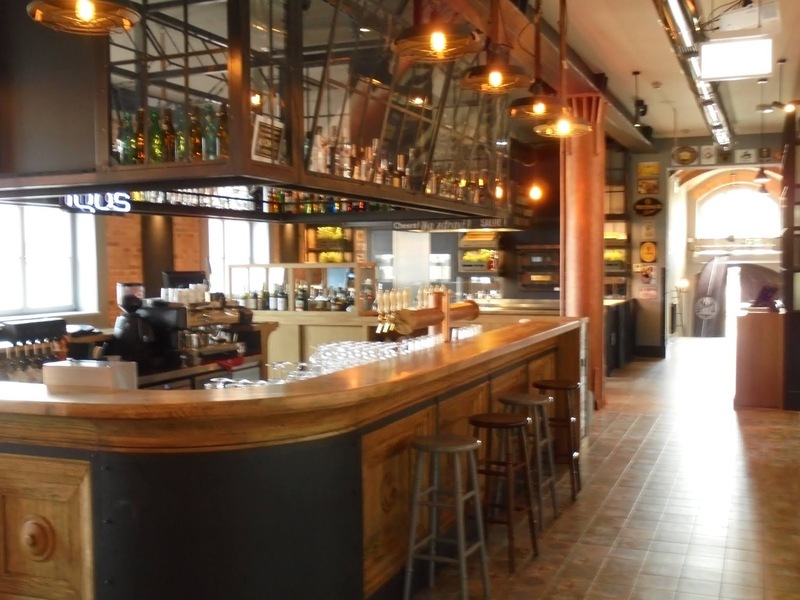 It is a vast space over two floors plus a sunny terrace, and the beer is very nice. On the way to the toilets I count four 20HL conditioning tanks and five more of 10HL, from Caspary. There may be more. The Pils has poor head formation and retention but is otherwise very nice: lemony menthol hops on the nose, full in body, bitter and sweet at the same time. Well above average. There is even a Rauchbier which of course I have to try. Massive woody smoked-ham aroma, though the body is a little on the thin and empty side. While it is clearly modelled on Schlenkerla Märzen, it also has a pleasant treacley note that also crops up in those 10% Polish porters. “Makes me sad we’re not in Bamberg,” says J. Like-for-like, I think Schlenkerla is better, but I might swap an old bottle of it for a fresh glass of this. 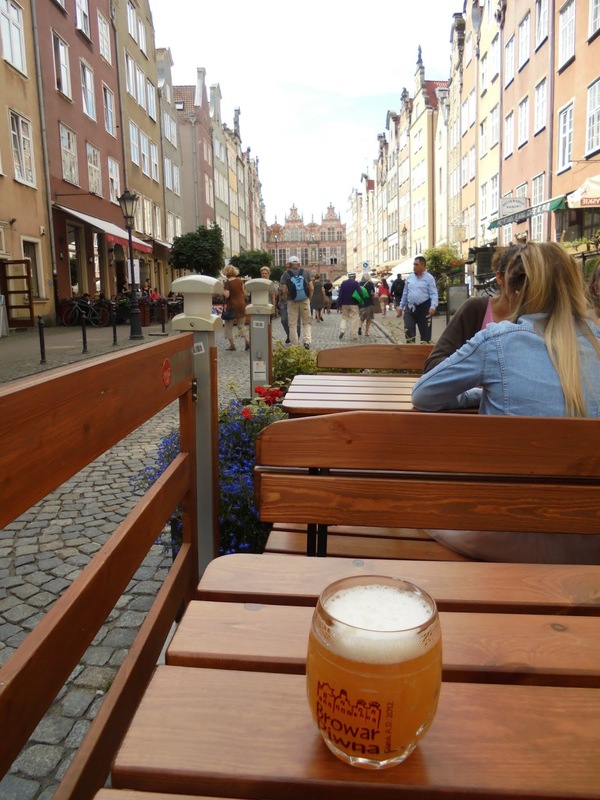 The one beer with a Polish name is Starogdanskie (Old Gdansk) which is a wonderfully fresh and clean malty beer. Very sticky, in a good way, with toasty notes and a hazy orange colour. Since our visit I have heard the brewer here is attempting to revive Jopenbier, so I am very curious about that. 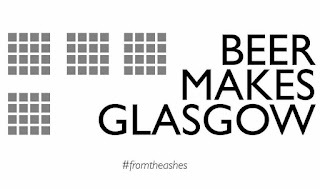 Tonight (Friday) sees the start of Beer Makes Glasgow, the festival which brewers and retailers set up last year to replace the collapsed Great Scottish Beer Celebration. It was such a success that it’s returning for a second year. 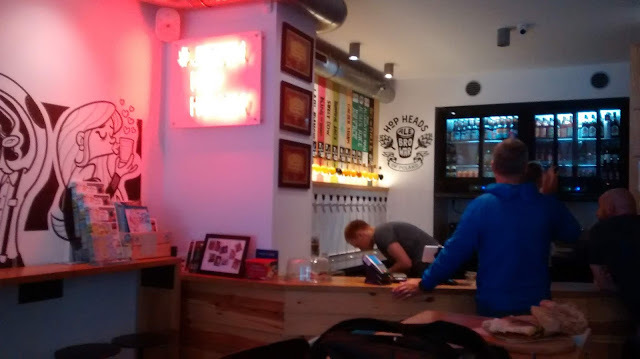 One of the peculiar features of Glasgow’s beer scene is the bottleneck of outlets, which means new and small breweries have very limited routes to market in the city. In the last few years a number of new wave producers – Up Front, Lawman, Out of Town, Gallus, Dead End Brew Machine, Ride – have sprung up, joined in 2017 by very slightly larger outfits Merchant City, Late Night Hype and the newest of all, Overtone. What all have in common is that hardly any pubs in the city will sell their beer, so if you want to drink it, it’s a matter of seeking out packaged product or checking the tiny number of draught outlets which occasionally feature one of them. So festivals such as this are a valuable shop window for some of (what I am these days calling) Glasgow’s secret breweries. Beer Makes Glasgow is worth supporting too as it’s the city’s most socially conscious festival, all surplus going to Drumchapel Food Bank. This year’s event takes place at Drygate, a decision taken early on to enable more to be donated. That was just as well, as last year’s venue, the former Beresford Hotel, is still closed following the huge fire that gutted the Glasgow School of Art just around the corner. Many years before I ever visited the Netherlands I learned through reading that it was commonplace for bar staff there to pour Pils with a large head of foam, which was then decapitated with a large bladed implement resembling a palette knife. I had thought this a peculiarly Dutch practice, but in recent years both Stella Artois and its competitor Heverlee have made a big thing of the ritual, emphasising a smooth, stylish skim with the knife as an essential part of the serve. The last time I was in Belgium I observed bar staff using skimmers on the draught Leffe et al too. To me it gives a glass of beer an unnaturally smooth, plastic appearance. I am not sure that I approve of it being used for beers beyond Pils, certainly not for the rocky head that forms on Belgian brown and abbey-type beers. In Germany it would never be used for Pils either, since in that country a tall crown of foam extending high above the rim of the glass is seen as a sign of a well-poured beer (although who knows whether that may change as corporations such as Heineken gain influence). I was quite surprised to discover that such skimmers – “beer combs” in American English – were also used in the United States until about the 1950s, and when I tweeted about the subject my colleague Allan McLean mentioned that he remembered them being used in Edinburgh, presumably for cask beer. In the US the story goes that these things fell out of use due to hygiene concerns, as the comb was left in a jug of stagnant water between uses. I doubt the rather cumbersome-looking contraption which was intended to solve this problem was ever going to take off (even if it did also promise to prevent the unauthorised removal of the skimmer by a “frolicsome customer”). Perhaps people instead just got used to allowing a natural head of foam to form, which I have to say is also my preferred option. Kölsch is a frustrating style to taste. I find it difficult to identify precise flavours in it, though I’ve drunk enough of it to be able to say “yeah, that tastes like Kölsch” (or not) when presented with an imitator from elsewhere. When in Cologne, as I’ve mentioned before, I always like to call in at Früh am Dom, even though it is decried by some as a tourist trap with dreadful beer. There is not much hope for such people, and the beer hall is a classic of its kind, even if you do have to occasionally duck out of the path of tour groups traipsing through the place. 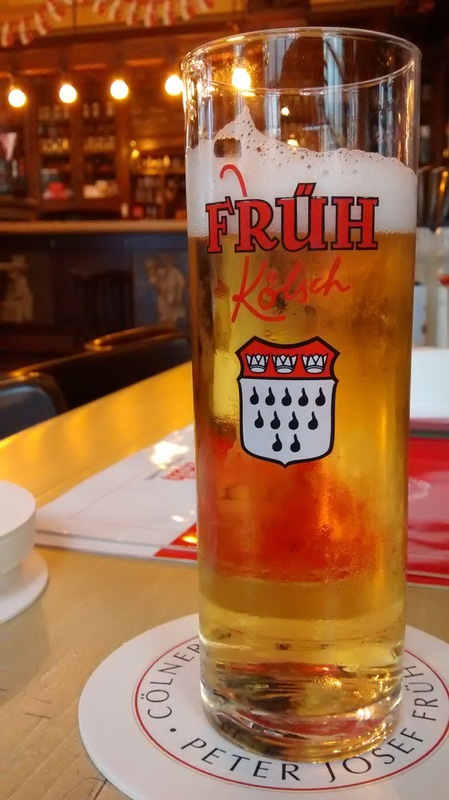 At its best, Früh Kölsch has a fresh maltiness and elegant, very slightly citrussy hop aroma. Quite by chance we discover it like this in the pub Em Golde Kappes in Nippes in the north of the city (forcing us to stay for an extra couple of glasses). The Golden Cabbage has been a Nippes institution for decades. Früh took it over a couple of years ago and put some cash into it. The number eleven has a special status in Cologne due to its role in the madness of Karneval, the pre-Lenten debauchery centered on cities along the Rhine. The Karneval season begins at 11.11 on the 11/11 – welcomed with oceans of Kölsch. For that reason a couple of years ago the P.J. Früh brewery chose to celebrate its 111th anniversary with as much effort as its hundredth. The delightful retro glasses pictured here were part of it. Making it to that age is, after all, an impressive achievement in a city whose breweries were, like the rest of it, almost completely flattened in the war. Many of Früh’s competitors, too, have long since been swallowed up by larger conglomerates, leaving only a handful of the 20+ Kölsch brands still actually produced by independent breweries: for example, Gilden, Sion, Sester and Küppers now all come from the same facility on the east side of the Rhine, owned by Radeberger/Dr Oetker. But once upon a time you could judge roughly where you were in the city by which local brand the local bars were advertising: Sester Kölsch in Ehrenfeld, Sünner Kölsch in Deutz, Gilden Kölsch in Mülheim, Reissdorf Kölsch in Sülz. Ironically enough, the full-spectrum dominance enjoyed by Kölsch locally is itself a post-war phenomenon and not nearly as old as the people who write the copy on the back of beer labels would have you think. But there are signs this is beginning to crack at the edges. In 2009 the Gaffel brewery brought out something they named “Kölsch classic”, less bitter than their standard Kölsch. That doesn’t appear to be made any more, but more recently they have also made an unfiltered golden beer called Sonnenhopfen with Citra hops. Früh also had a go in its eleventhiversary year, and launched a new beer of its own. “Rude Pitter”, or Red Peter in the local dialect, was a malty bronze beer. It was a bit sweet for my liking – but the problem is that if it were more bitter, it would be dangerously close to a Düsseldorf-type Altbier. Imagine the shame! There are limits to experimentation, after all. For once I’m managing to post these before the end of the year. I hope everyone has had a good a year as I have – although looking through my grey, drizzly photos from 2017 I could have done with a bit better weather for most of it. 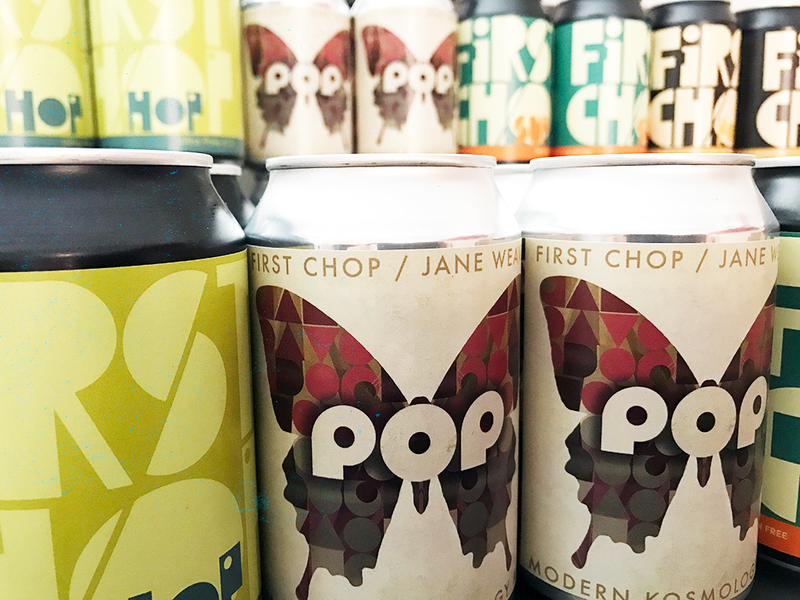 It would now be pretty easy to stock a pub purely with beers made in and around the city of Glasgow itself and still provide plenty of choice – something you couldn’t have said just a few years ago. Most of these new starts have occurred in the last couple of years. My choice for the best new local brewery is Out of Town – which as the name implies is based on an industrial estate in Cumbernauld (incidentally, the same one Lawman is on). Many brewers produce beers which are impressive on the first sip; the Out of Town beers are distinguished by their massive drinkability too. They started up near the end of 2016 but it’s really been in 2017 that their beers have become ubiquitous in the city. Even newer breweries have started up in the latter part of the year – Ride in Tradeston, Merchant City in Maryhill, and Late Night Hype in Clydebank. Too late for any of them to quite make it as best new local brewery, but what I have had the chance to sample from all of them has been promising. I’d usually make my beer of the year something I’d drunk regularly, but what with one thing and another my pub visiting has declined this year. So it’s the beer which stuck in my mind the most. Up Front Old Man Ahab (7.1%) managed to fool drinkers at the Paisley Beer Festival into thinking it was made with coconut – yet the brewer subsequently denied that there was any coconut in the beer. The power of imagination seemed enough to give the beer a delicious coconut aroma and flavour (more fresh coconut than Bounty bar, since you ask). It’s a great shame that Up Front can’t make their desired margin on cask beer, which is why there is so little of it. Runners-up: A chance half of North Riding Single Hop Centennial in April had amazing lemon and resin aroma, light and clean in body with a long bitter finish. The best beer festivals are when you start googling a brewery you’ve never heard of because the beer is so good. 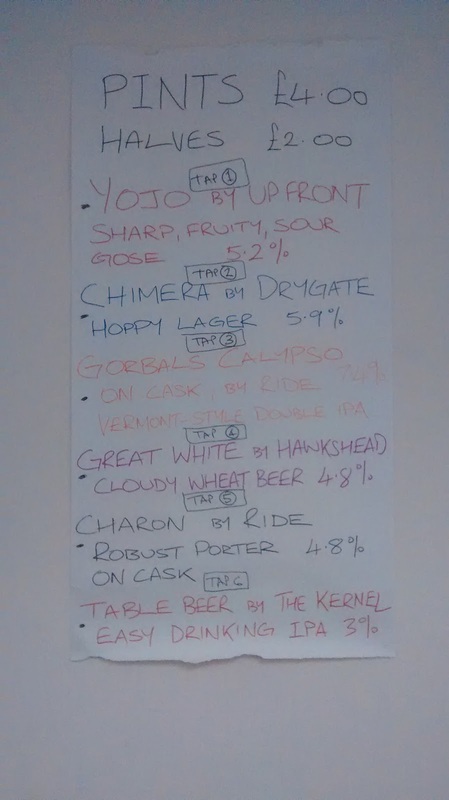 The Five Points Pils I had at a tap takeover in Edinburgh was pretty impressive – “This is what a pils should be like!” say my notes – with fresh CO2 and herbal hops (Tettnanger is what’s used). A full, sweet malt character puts the over-attenuated hop extract water produced by some German breweries to shame. A worthy rival to a previous winner, Fourpure Pils. Yet the second glass of it – poured to the brim in a half-pint glass – was underwhelming, showing that a lot of the joy of pilsner is down to serving technique, something which is still neglected in the UK. Lager needs foam! Runner-up: Until Loch Lomond arrived with their Out of Range IPA, the New England style locally had been the preserve of semi-hobby brewers, notably Gallus whose first beers made it something of a house speciality. Out of Range brought it closer to the mainstream, and nailed it in flavour. 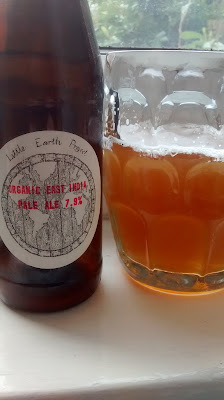 Organic East India Pale Ale by Little Earth Project is my bottled beer of the year. I discovered it while searching for authentic 19th-century style IPAs – there are fewer of these than you might think – back in July and already knew I had found this year’s winner. A gueuze-like aroma meets the nose, followed by faint oak and a bit of lemon with wild yeast esters. But take a sip, and it’s not sour – perhaps just on the border where bone dry tips into slightly tart. Maybe the slight lemony note encourages the association but the pithy bitterness immediately brings marmalade to mind. It’s a dry beer with only a ghost of malt sweetness remaining. You have to get used to the overall flavour profile of it (well, I did) before it’s possibly to discern the sweetness below with notes of leather and tobacco. This really shows it’s worth doing things the old-fashioned way. Recommended by me, Captain Tightwad himself, as genuinely worth the £5 for a 330ml bottle. Runner-up: The Pale Armadillo by Tempest, on the other hand, is cheap as chips and is one beer which manages to be amazing both on draught or packaged. Ridiculously quaffable dank pale ale. Still Schlenkerla Märzen I think. Though the quick Schumacher Alt I had while changing trains in Düsseldorf in May was pretty good too. 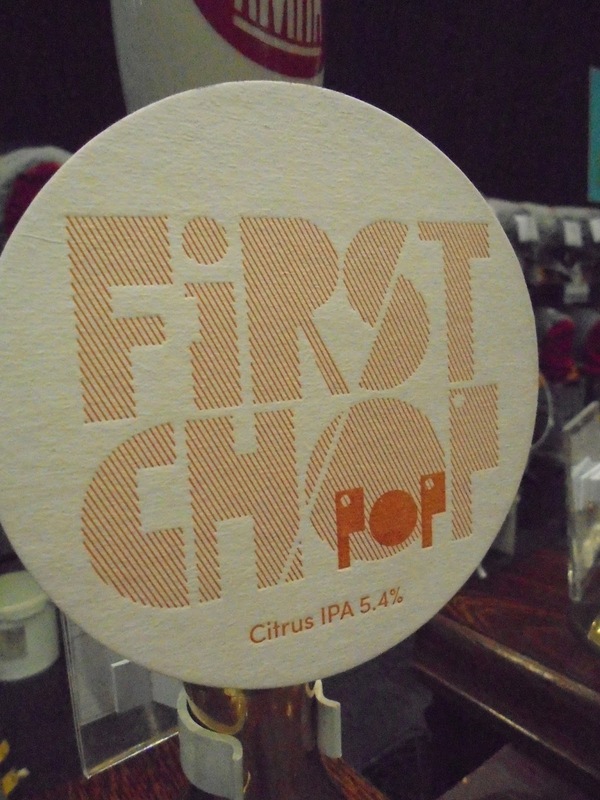 The letterpress-on-beermats style chosen by Salford’s First Chop is simple but striking and effective. Their bottles and cans aren’t half bad either – I love the use of a bold but subdued colour palette. There are so many breweries now, with attention focussed on a tiny number of them, that it’s impossible to pick out just one that doesn’t get its due. 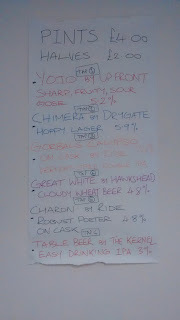 I’ve very much enjoyed beers from Wylam, Bear Claw, Top Out, Holdens, Lacons, Ossett this year. If you see them, try them too. I’ve gone a bit further afield for my pub of the year. 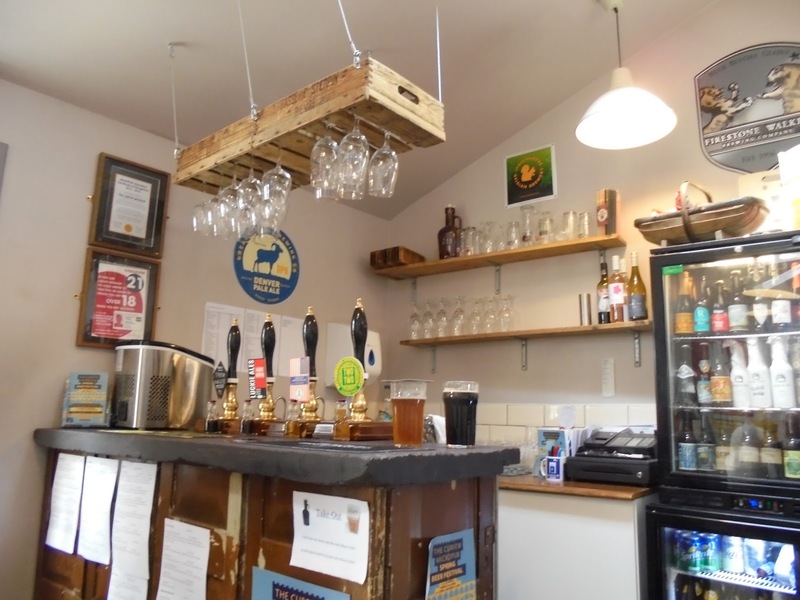 It’s the Curfew Micropub in Berwick-on-Tweed. 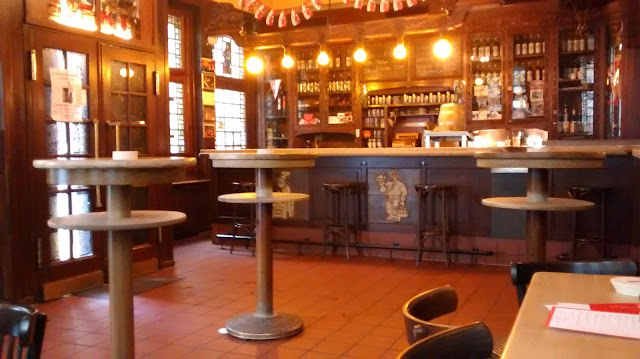 It is a delight to drink there, even if it is often impossible to find a seat. Bonuses are their championship of local breweries and beer festival in the spring, for which a second bar is opened up in the storeroom. I also had my best pork pie of the year here, although this might have been part of the beer festival and not permanently on offer. This year Grunting Growler in Glasgow’s Yorkhill finally got its on-sales license – which was apparently needed so they could offer tasters – and took the opportunity to add some seats too for tastings or just to sit and have a beer. I’m not sure whether owner Jehad Hatu really meant to end up running a bar but it’s essentially what he’s now got. He is also the only person I know who can get away with greeting you with the words “Hey, y’all down to clown?” and still be cool. Runner-up: Koelschip Yard. Definitely a worthwhile addition to the south side, but they should have done it five years ago when I lived there. Conor Steven of Cafe Source Too is one of the unsung heroes of Glasgow’s beer scene. As well as helping save the day when Hippo’s beer festival was cancelled, he somehow found time to organise his own, the West End Beer Festival. It featured the cutting edge of the local breweries, as well as some from further away, such as Brass Castle, who came up specially and brought their beer-dispensing piano. It also featured a dramatic unintended plastic keg explosion, which I’m not allowed to tell you about. 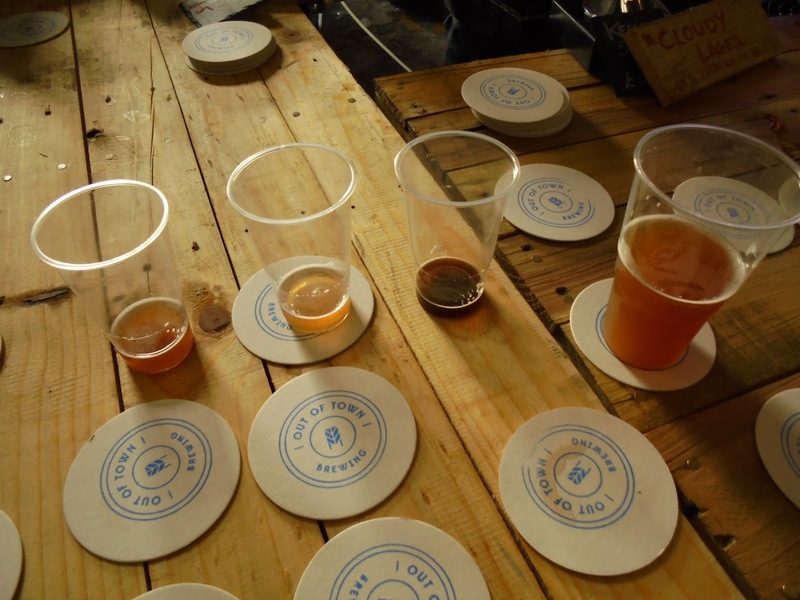 Runners-up: I enjoyed the Edinburgh Craft Beer festival much more than I expected to. But I still came home drunkest from the Paisley Beer Festival. As regular readers may have noticed, I am sceptical of most murky beers. I still try them. Most are harshly bitter and unpleasant (whether the harshness comes from yeast or incompetent hopping I care not). Others are sweetish and reminiscent of turbid mango juice, in which case I’d rather just have the mango juice, which would be easier on my wallet and my liver. The stand-out exception this year, however, has been Dead End Brew Machine’s spectacular canned Decay IPA. It looks hellish, like muddy khaki soup (possibly broccoli) with soapy scum on top, but it tastes fantastic with a perfect balance of dank hop flavour and tropical juiciness. 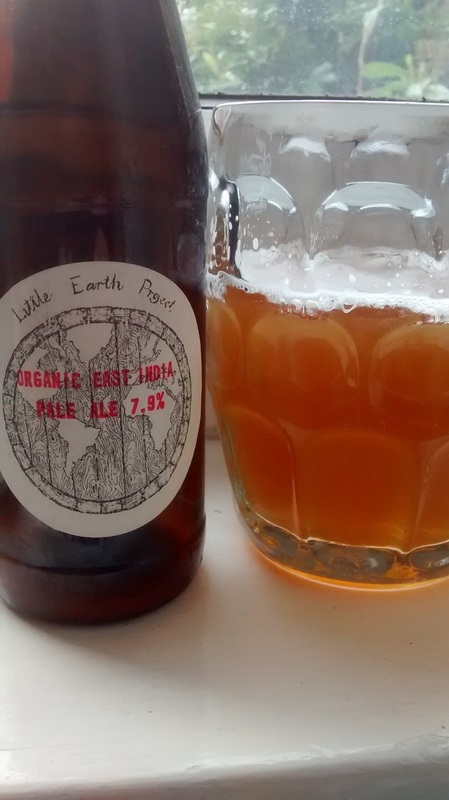 It’s good to see Chris Lewis’ commercial beers – still basically a hobby – now matching the quality of his remarkable homebrew. 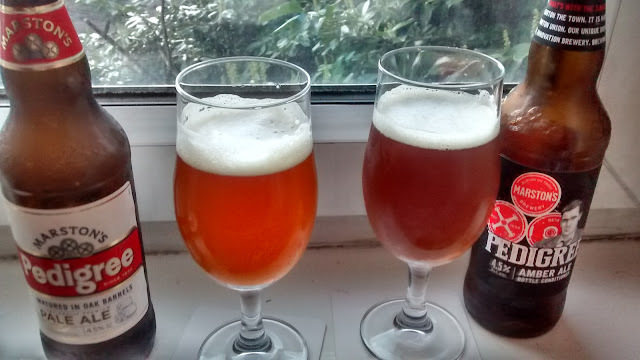 Waitrose and Marks & Spencer have both stepped up their beer game in the last couple of years – but I think that Waitrose have perhaps come further in a shorter time. Waitrose it is, then. Where else can you get Fuller’s imperial stout in a supermarket? With the sad collapse of the Hippo Beers empire it’s down to a four-way dance-off between Valhalla’s Goat, The Cave, Grunting Growler and Good Spirits Wine & Beer. There’s not much in it, they are all good. I guess I have bought more from Good Spirits than any of the others. The Wee Beer Shop is too new for this year’s award but I expect it to be in the running next year. “Whilst drinking 6X, this cool generation were wearing Adidas and playing vinyls way before their children and grandchildren,” said head of marketing and communication, Elaine Beckett. I don’t know how you get to be cool but I do know that you don’t do it by announcing how cool you are. Also, they’re called records. When I moved to the south side of Glasgow fifteen years ago, I’d never lived quite so close to such a wide range of pubs before. I could nip out late at night for a sneaky pint and be back home again in twenty minutes. The pints would be at Samuel Dow’s, the last-but-one relic of a pub empire that once owned pubs all over the city, all called Samuel Dow’s (The remaining pub is in Dundas St opposite Queen St Station). At that time Samuel Dow’s sold Harviestoun and Fyne beers in very good condition. I remember one morning a friend came round to help me homebrew. We were very proud to get the mash on and be at Dow’s for opening time. 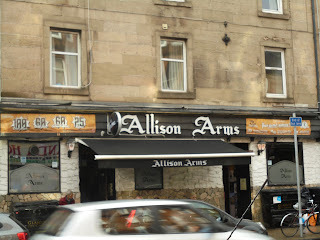 Alternatively there was the Allison Arms and its magic fridge. Time went on, Samuel Dow’s got a new licensee, the beer quality declined and eventually it was converted into a branch of Lebowski’s, the group that runs a selection of other dull bars around Glasgow. Inevitably, it was only once I moved elsewhere that things started getting interesting again. The stretch of Pollokshaws Road between Queen’s Park and Calder Street has been extensively hipsterfied (or gentrified, depending on how you see things) and now offers a wide array of eating and drinking establishments, with more due. There are three coffee shops alone within fifty metres of each other. Ranjit’s Kitchen, Glasgow’s leading vegetarian curry house, stands out in an area endowed with many excellent curry houses. Just off Pollokshaws Road, Locavore, a social enterprise devoted to local food and small-scale farming, is doing so well that it’s moving for the second time to new and bigger premises, a former pub (the Pandora) not far away on Victoria Road. This area has very quickly leapfrogged the over-hyped Finnieston north of the river – possibly because it’s still affordable for the bohemians to live nearby who make the area interesting in the first place. 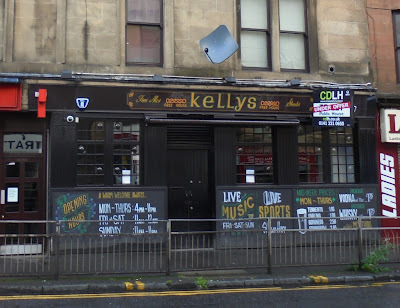 The latest news is that Koelschip Yard – a bar in the mould of Edinburgh’s Hanging Bat and Salt Horse – is to open in premises that were Kelly’s bar until fairly recently. 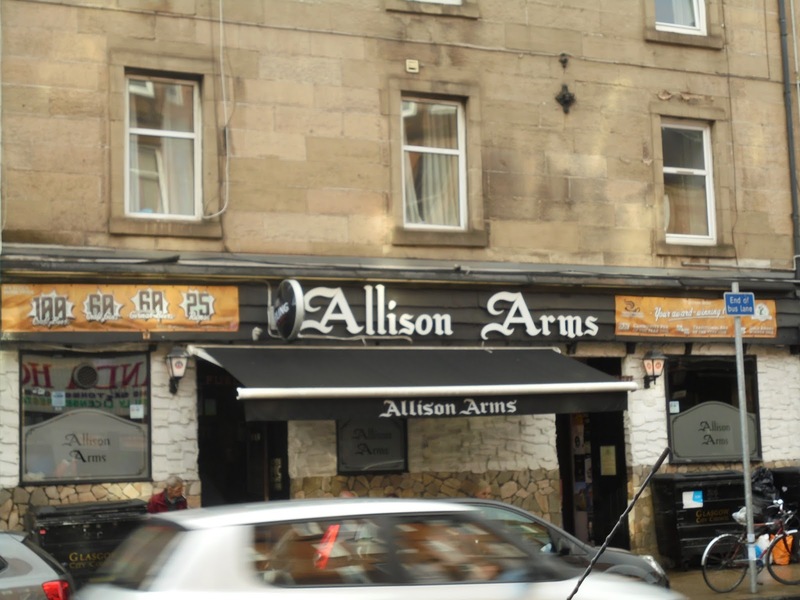 The Allison Arms has been more fortunate than Dow’s or Kelly’s: still going strong, having attracted a new and hip clientele, and the beer fridges have expanded to fill almost an entire wall. Well-established cafe Gusto & Relish is still there too (which was already doing beer menus back in 2011). 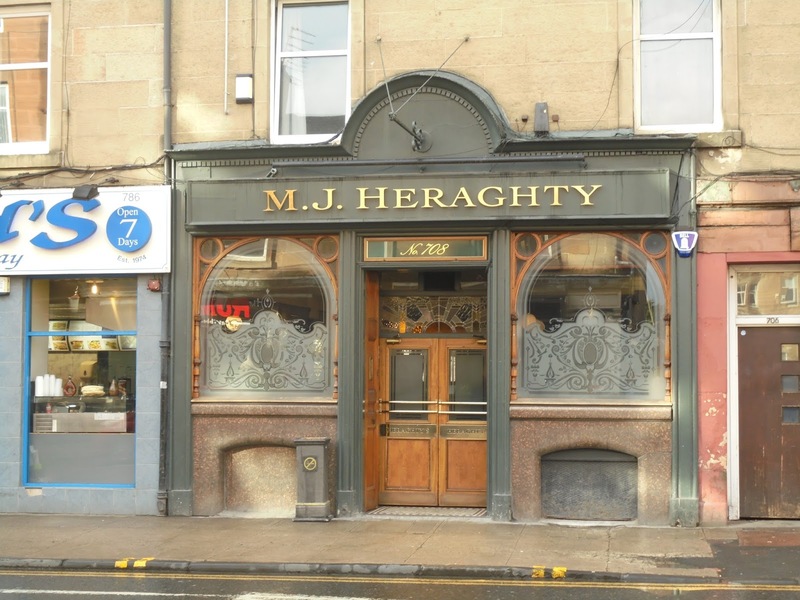 Of course, Heraghty’s Bar seems set to go on forever, or at least as long as Jack McLean is still to be seen standing outside the front door. The old Kind Man/Strathie has been refurbished as The Rum Shack which has been developing a reputation for its food, music and rum, though I haven’t been in to check out their beer. In the immediate area only the Regent and the Titwood Bar remain with the old formula of “men and Tennent’s”. It remains to be seen how long they will survive with it. Further north, still just south of the Clyde, the Laurieston Bar is now the only pub on the block. Of the two other, decidedly dodgy, bars on Bridge Street, the Waterfront (once a handsome pub called Stevenson Holmes & Co., and latterly the Glaswegian) closed and has since been refurbished to become a vegetarian Chinese restaurant, while the Sou’Wester just closed. Just round the corner, though, Glasgow is getting its first railway arch brewery, in the shape of Ride Brewing Co. Owner Dave Lannigan has been talking about this for as long as I’ve known him and it’s finally open for business. This is very good news, because while I haven’t had much of Dave’s beer it’s always been impressive: elegant, extremely well balanced and drinkable. It’s a tiny outfit still, with 200L fermenters, but as Dave has been brewing on glorifed homebrew kit until now, even that is a big expansion. One advantage of being so small, of course, is that you don’t need many outlets for your beer. 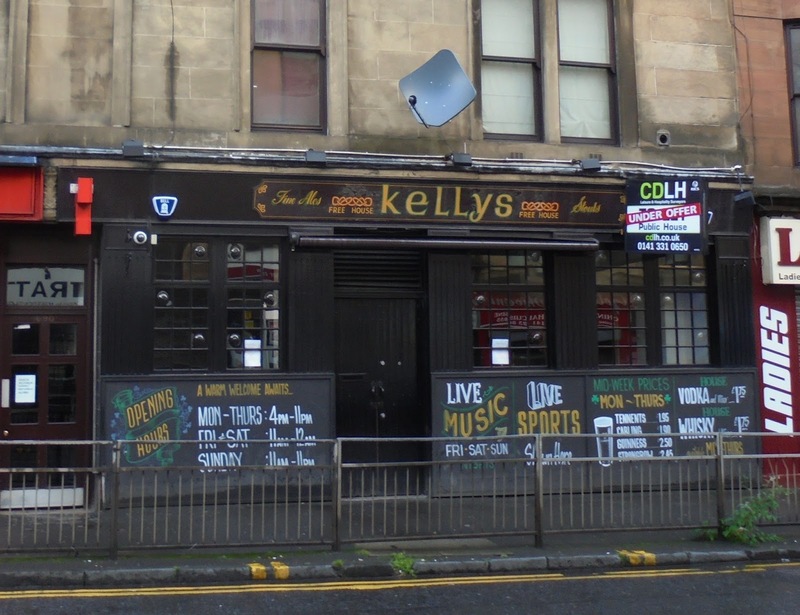 The Old Toll Bar in Kinning Park – which has just put in its second handpump – Marchtown, and the new Wee Beer Shop mentioned above will be selling Ride beer. Of Ride’s first commercial beers, Gorbals Calypso is a 7.4% Vermont-style IPA, a style which Glasgow nanobrewers have taken to their hearts. The keg version is quite full-bodied and tropical. In the cask it’s quite different: more highly attenuated, drier, and the citrus and pithy bitterness come through more. Charon is an American-style “robust porter” with Chinook hops, very roasty and bitter. 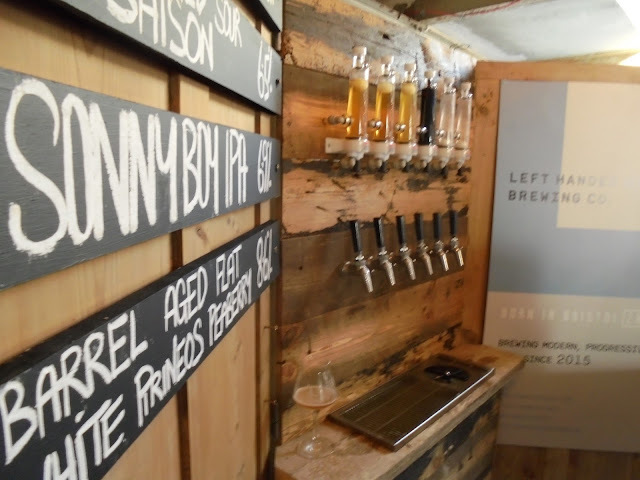 Both were on tap at a pop-up back on the Bungo booze trail – the Wee Beer Shop. It isn’t a shop yet, as owner Niall Kennedy has only just got the keys. As yet there are no shop fittings or even a sign, but that doesn’t stop you having a pop-up these days: all you need is for the electricity to be working and to know some brewers. Besides Ride there was a new beer from Up Front – Yojo, a fruited gose with kalamansi. This is exactly the sort of beer I would instinctively say shouldn’t be allowed, but Jake at Up Front has pulled off another cracker: the bitter citrus fruit is subdued and merges sublimely with acidity and salt. 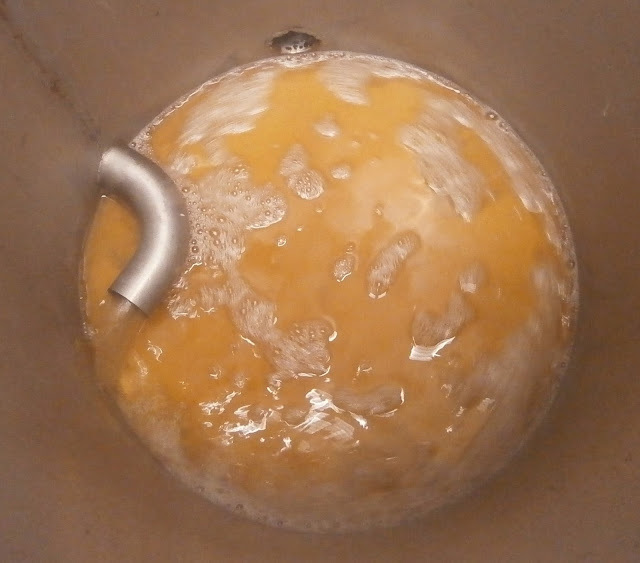 Just to confound my prejudices further, this beer is kettle-soured. Niall explained that his focus will be mostly but not exclusively on Scottish beers, with a range perhaps slightly less esoteric than Koelschip Yard across the road will offer. Less than a year ago Marchtown wine and beer bar/shop launched itself with a similar pop-up just a few steps down the road. I called in on the way to Wee Beer and every table was packed. If Wee Beer can have the same success I imagine Niall will be very happy. Like many other drinkers I was shocked and saddened when Glasgow beer business Hippo Beers suddenly went into liquidation. The group which ran a beer shop and just over a year ago opened its own bar, the Hippo Taproom, closed its doors and appointed liquidators at the end of July. I’m particularly sad because I’ve seen the business start up right from the beginning and can imagine how much work the founders Derek and Alec put into it. When the Hippo shop on Queen Margaret Drive finally opened I was the first customer through the door (I wanted them to be able to say there were customers waiting outside). One of the earliest events I remember was a brewing demonstration in the shop with the homebrewers who went on to form Out Of Town. That particular beer had to be dumped due to someone’s insistence on using far too much rye. The boys were back at Hippo Taproom a couple of years later to launch their brewery. Chris Lewis of Dead End Brew Machine also credits Hippo with giving him the impetus to go commercial. I do not know the reasons for the liquidation but some people are speculating that there just wasn’t enough trade. Compared to other specialist stores Hippo was a bit out of the way, and not near any convenient public transport. Although the inhabitants of the surrounding area are precisely the demographic likely to buy its wares, perhaps a beer shop also needs to attract custom from elsewhere. 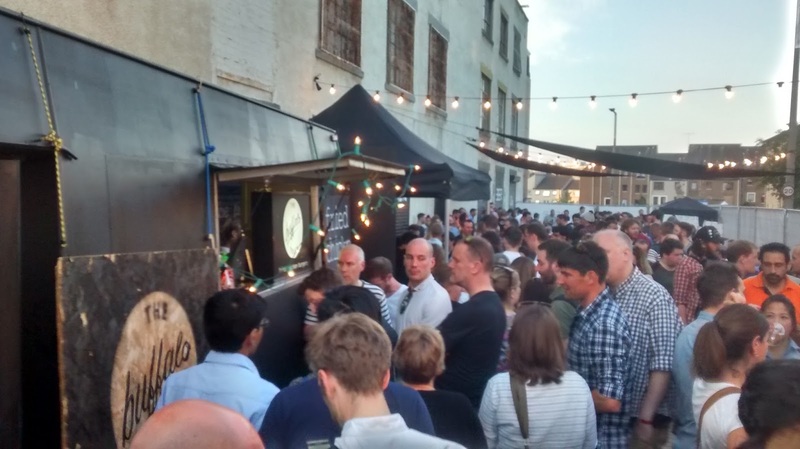 The Taproom was rarely busy but put an extraordinary effort into organising special events and – unlike some beer bars – offered several well-kept cask ales. Perhaps its location, among the Saturday night drinking barns of Sauchiehall St, didn’t do it any favours either; though it made a pleasant pub crawl from there to the State Bar round the corner (and sometimes back again). The liquidation came at a particularly inconvenient time, as the team were in the middle of organising their festival, the Great Scottish Beer Celebration, which had previously taken place at the Barras and this year was planned for the Art School. Happily, brewers and other beer retailers have come to the rescue and organised an ad hoc consortium to allow the festival to continue. “I was basically asked ‘do you fancy helping get the thing moving again’ … it’s been very much a collective since the beginning,” one of the organisers told me. 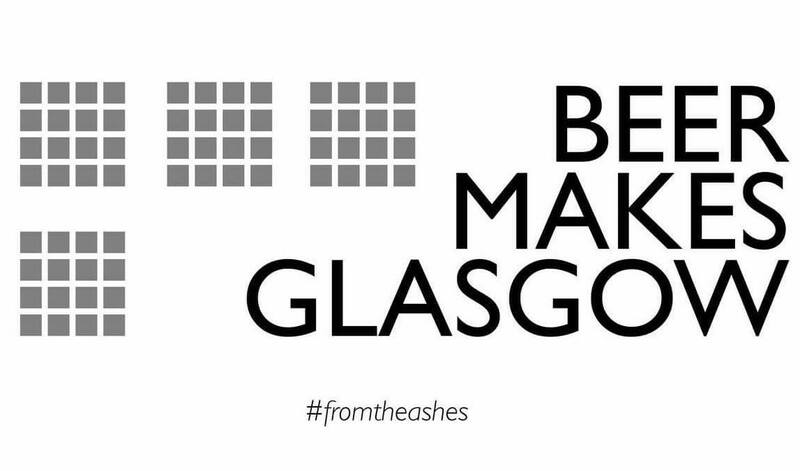 It will be on the same dates in the same venue, but under the name Beer Makes Glasgow (a take on the city‘s own PR slogan “People Make Glasgow”). Ticket holders for GSBC should contact beermakesglasgow@gmail.com or just turn up for the same session originally booked. Tickets can be obtained from https://event.bookitbee.com/e/w3bt3. Proceeds from ticket sales will be donated to the Drumchapel Food Bank. I don’t know whether the Edinburgh Craft Beer Festival’s invitation to brewers read “Come along, and bring your wackiest beers”, but it might as well have done. This “curated” festival (uh oh) promises to bring “the world’s finest breweries” (of course) to “celebrate passion, creativity and quality in brewing”. It didn’t sound like my kind of thing at all. If you’re used to reading this sort of stuff, it will come as no surprise that the festival glass is a Teku, which in addition to its ugliness and awkwardness gets rather uncomfortable to carry around after a while. The venue is one positive feature: The Biscuit Factory, is, believe it or not, a former biscuit factory (Crawford’s, if you care that much), and the semi-derelict industrial building offers a ready-made “authentic” backdrop for the hipster aesthetic that is now so often artificially created at great expense. The very steep and narrow staircase inside is a less positive aspect. Signposting is poor and some visitors may have missed the sunny and airy upper level entirely, which would be a shame as it is much more pleasant up there than on the gloomy ground floor. Commonplace in the USA but still rather unusual in Britain is the ticket policy: entry is an initially eye-watering £38 per session, but beyond that you don‘t have to pay for beer and can just wander around having your glass filled with samples of whatever you fancy. This is probably the best way to serve some of the very strong beers anyway. A late announcement that visitors would be limited to a total volume of six pints caused some disquiet on social media, but seems reasonable to me (though heaven knows how they were planning to police it): the last thing you need on an unseasonably warm Friday evening is people tanning imperial stouts in an effort to get their money’s worth, especially given the potential for falls offered by that staircase. One technical feature that other festivals would do very well to emulate is the provision of jerry-cans of fresh water for rinsing glasses. 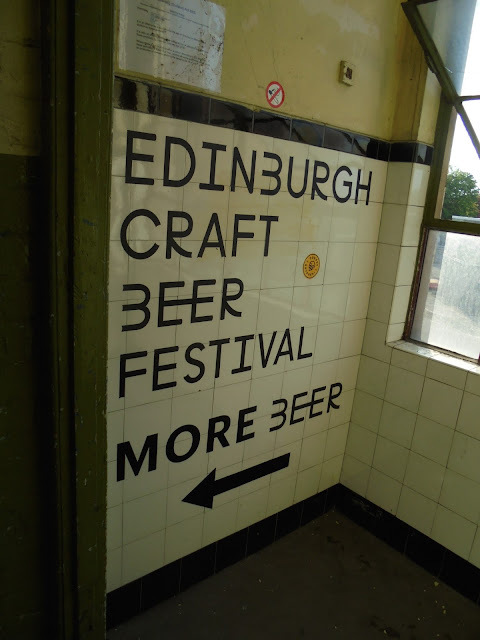 The “Edinburgh” in ECBF is very much a description of the location, not the origin of the beer. Pilot from Leith are the only local brewery represented, and the majority of the breweries are from outside Scotland. Cromarty, Six Degrees North, Tempest, Fierce, Fallen, Speyside and, embarrassingly, supermarket-friendly media clowns Brewdog make up the remainder of the Scottish contestants. I begin with Wylam, a criminally under-rated brewery from Newcastle. They specialise in properly bitter pale ale, and their Sorachi Ace pale is exactly what I expected from them, with the typical raspberry, plastic and sweat flavours of this divisive hop, followed by a long dry bitter finish. My biggest regret is not making it back to the Wylam stand. More Sorachi Ace comes from Brooklyn Brewery, a vaguely saison-y thing with lots of yeast flavour and after the intensely bitter Wylam effort it seems unpleasantly sweet. Moving on to the Sierra Nevada stand, there are several beers not usually seen in the UK. Festival Bier from Sierra Nevada is a tasty, malty festbier perhaps a bit on the sweet side (one could, of course, make the same complaint about many German versions). Their Celebration fresh hop ale with its resiny hops smells curiously dated in this world of lychee and melon-scented beers. The flavour even more so: I’d almost forgotten about the love US brewers once had for huge amounts of caramel malt. 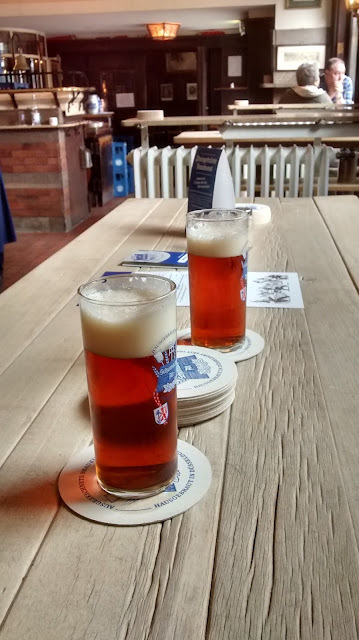 Cromarty have a Vienna lager, Arctic Swell, which holds its own well even among the boozy dessert-flavoured monster beers, with a nice toasty character and a reassuring sweetness. It reminds me a lot of Brooklyn Lager, but perhaps that has now become the international benchmark for the style. I’d given up on Cloudwater after two separate purchases of their Mittelfrüh lager had an identical issue: non-existent head retention, with the foam shrinking to absolutely nothing within minutes of pouring. I gave them another chance. The good news is the foam was fine. The bad news is that the beer was riddled with sweetcorny DMS, and I was glad to be able to pour it away. Do you remember a couple of years ago, when cupcake shops were popping up left, right and centre, purveying sickly sweet icing (sorry, “frosting”) atop a tiny sponge cake base? Despite being mostly white sugar and refined flour, and unutterably disgusting to boot, they found ready cheerleaders among food media that normally pray dutifully to the idols of local ingredients and fresh produce. This appears to be the phase that “craft” brewers are now passing through. Lactose merchants must be making a killing at the moment. Once a specialist ingredient used in only one style of beer – milk stout, which was practically dead anyway – brewers now seem to be throwing it into all manner of concoctions together with dessert or breakfast flavourings. Maybe this fad will pass, but given the general novelty-chasing that characterises the beer scene, I’m not getting my hopes up. Can you imagine a winemaker anywhere on this earth proudly saying “Stoked to have made a cheesecake Pinot Noir with bacon and Golden Grahams”? I can’t. And cheese connoisseurs have only scorn for those who foist woefully immature Wensleydale with cranberries on consumers. They know that this bizarre phenomenon distracts from appreciation of the infinitely variable flavours and aromas of actual cheese. Perhaps one day the beer scene will achieve such maturity. 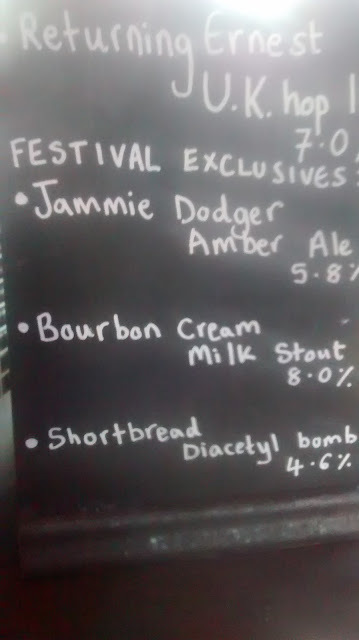 At the risk of developing diabetes, the eager enthusiast could choose from a barrel-aged flat white coffee stout (Left Handed Giant), a maple syrup, coffee and pancakes stout (Pilot) or even an imperial maple blueberry cheesecake stout at 12% (Dugges/Omnipollo). Pilot’s effort tastes of coffee and burnt toast, and they do this sort of thing better than most. For dessert, Northern Monk’s notorious Neapolitan Ice Cream IPA is also available. With almost no aroma beyond a vague milkiness, this does actually taste like Neapolitan ice cream, without the pleasure. It very quickly becomes overpoweringly sweet, and personally I’d rather have the ice cream. At Põhjala from Tallinn, the lactose has even got into their raspberry Berliner Weisse. Predictably, the resulting drink tastes like a Munch Bunch fruit yoghurt. Bristol’s Wiper & True have put some thought into their specials and used the festival venue’s heritage as inspiration to brew three biscuit-themed beers. There is a leaflet and everything. I only try one of them: many brewers accidentally make diacetyl bombs, but Wiper & True may be the first to do it deliberately and name it thus. Shortbread Diacetyl Bomb is intended to replicate the buttery flavour of said biscuit. I find it undrinkable, more due to the intense sweetness than the butteriness. It’s certainly educational, especially if you don’t already know what diacetyl tastes like, but the thought strikes me that this would be better set as homework for brewing students rather than inflicted on the public. The “normal” beer on offer from Wiper & True is another semi-experiment: a Vermont-style IPA made with English hops, called Returning Ernest. The hops are Ernest, Olicana, Jester and UK Cascade and while these contribute New World-type fruity aromas, particularly pineapple, there’s an underlying texture of “English” woodiness too which is rather pleasant. Ironically enough, it’s the American brewers who come up with sensible beers. Firestone Walker’s 805, though top-fermented, is what the Cloudwater Helles should be: clean, sweet, without off flavours. Sierra Nevada’s orange IPA sounds gimmicky but the pithy citrus bitterness enhances the beer rather than dominating it. Their Tropicuzu (apparently the only kegs of it in the UK) displays fruity hops and grapefruit zest with a peppery finish. Pretty nice. It’s telling that one of the less ridiculous beers is a rhubarb and citrus sour. Fallen and Pilot have made it. It’s better than many, but more due to the strong scent of citrus zest than anything else, giving it a kind of adult limeade taste. Fallen’s new-ish double IPA, The Big 1, is nicely pungent, yet oily and sweet, which has become par for the course with such beers, since the staggering amount of hops needed to effectively balance out a gooey 8.5% beer is frankly nonsensical. As the DJs turn the volume up and the place starts to resemble a goth disco, I decide it’s time to leave. ECBF is certainly doing something that other festivals aren’t, even if it is basically “drink tiny measures of very silly beers that you wouldn’t be able to finish a pint of anyway”; there’s a market for it and it definitely makes a change. I did enjoy myself, much to my surprise. More to the point, the punters who’d forked out to get in seemed to be having a good time too. Disclosure: The PR company handling the event offered me a free ticket to the Friday evening session. I wouldn’t have gone otherwise. Due to the nature of the ticketing, this also meant that I drank for free all night. You decide for yourself whether you think my judgement is skewed by these facts. There was disbelief and scorn aplenty a few months ago when Marston’s announced a radical rebranding of their core range. Say what you like: the defining feature of craft beer is distressed type and a style of graphic design that was briefly fashionable ten years ago. Nothing else matters. It can be cheap, expensive, brewed in a small brewery, brewed in a large brewery, brewed in somebody else’s brewery, made with silly ingredients, not made therewith, hoppy, bland, well made, badly made, anything. The only thing that counts is the distressed type. Funnily enough, the old labels described the beer as “crafted since 1834”, but the new ones don’t. Gone, too, is the claim on the old label that Pedigree is “matured in oak barrels”, a lie so outrageous that I meant to blog about it two years ago, but never got around to it. The beer is also now an “Amber Ale” rather than Pale Ale – 200 years of Burton brewing heritage thrown in the canal just like that. It appears marketing people throughout the industry now consider a Pale Ale to be one of those vaguely citrussy golden things. I don’t drink much Pedigree usually. I find the cask version quite bland, but frustratingly it is (like its cousin Bass) only a few steps and maybe some extra dry hops away from being a nice beer. I also crave the sulphury whiff which – equally frustratingly – Burton brewers have been successfully trying to eliminate from their beers for the last three decades or so. At times I have even thought the bottled version was superior, possibly because one has lower expectations of bottled beer to begin with. Nevertheless, Pedigree is inarguably an iconic British beer, and I thought this change would be a nice opportunity to compare the old and new bottled versions. Given the pig’s arse Marston’s have made of the branding, I am pleasantly surprised to report that the beer itself has improved. The major difference is that the bottles are now bottle-conditioned (and presumably, corollary with that, no longer pasteurised). Both pour with a nice dense collar of foam. Old Pedigree appears much paler in the glass than New Pedigree, but that is possibly because, surprisingly, it is not entirely bright (remember, this is the brewery-conditioned one). Obviously this beer is a few months older than the new bottle (I bought it and then had to wait for the new version to appear on the shelves, which took longer than anticipated), but still well within the best-before date (31 July 2017). The aroma is slightly sugary, the taste crisp and minerally as a Burton Pale Ale ought to be, the finish dry and only slightly bitter. Sadly, this bottle is showing its age despite still having a notional five months of shelf life, which just goes to show you shouldn't buy old beer whatever the label says. New is a generally cleaner and fresher-tasting beer, the sugary note on the nose has gone and although it is a lightly hopped beer, there is a fair bit of hop flavour and a decent bitterness. There is very little yeast sediment, and you’d probably never realise it was bottle-conditioned if it didn’t tell you on the label. Only on the nose, or if you swill the dregs around is there a bit of yeastiness. Whether the fresher taste is down to the bottle-conditioning, the lack of pasteurisation, or the fact it actually is fresher (best-before date 31 December 2017), I guess we’ll never know. Cumbernauld is one of the Scottish “new towns” stamped out of the ground in the aftermath of the Second World War, to ease the overcrowding of the big cities and allow for massive slum clearance there. To outsiders, it’s best known as the setting for the Bill Forsyth film Gregory’s Girl. It’s only a very short walk from Cumbernauld railway station to the little industrial estate, and if I were a Cumbernauld commuter I’d wish the brewery down the wooded path had an off-sales licence. Maybe one day, but on this still rather frosty morning it’s time to get to work. With over 100 brewing operations now active in Scotland, it was inevitable that someone would start up a brewery here, and Craig Laurie was the man to do it with his Lawman Brewing Co. The name comes from Craig’s legal studies at university; there, however, he discovered homebrewing and real ale, and on completion of his degree went to work at a brewery instead of at court. 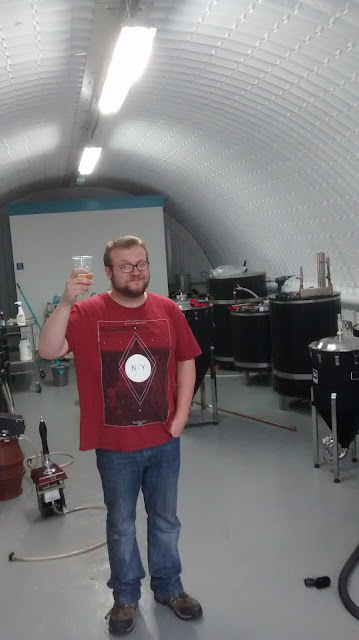 Craig struck out on his own in late 2015, first brewing tiny amounts in his own kitchen and then moving to a dedicated unit. Brewers often like to latch on to the history of a previous, defunct local brewery, but that’s not an option here: as far as anyone can find out, Lawman is the first commercial brewery that’s ever existed in the town; the villages that made way for the New Town were too small to have supported one, even prior to the 1960s conglomeration of Scottish brewing. Craig started out with an American pale ale, Horizon, and Steadfast, a Köln-style effort. The most impressive of these early beers to me was Weatherall IPA, a marmaladey strong country bitter which perhaps is not much like what people think of as an IPA these days, but none the worse for that. The main beers now – at least the ones I see most often – are the pale ’n’ hoppy Pixel Bandit, featuring Admiral and Belma hops, and Onyx stout, which has been dubbed “Stouty Stout” by drinkers. 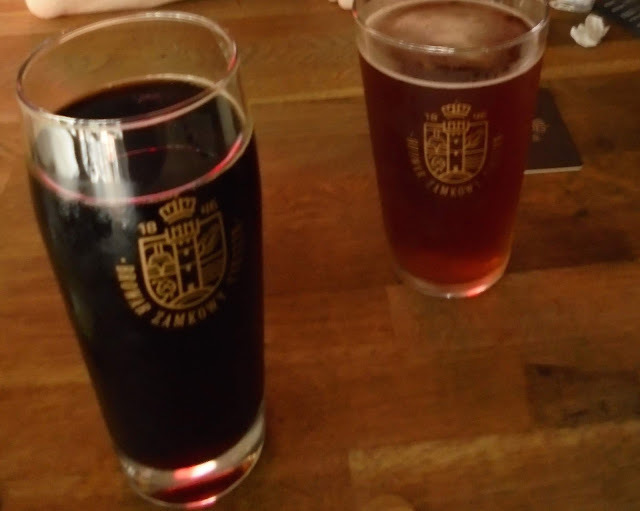 A rye beer called Mr Beast followed and there’s a black IPA occasionally which I haven’t tried. Craig is brewing Pixel Bandit today. I’m “helping” (i.e. trying not to get in the way too much.) 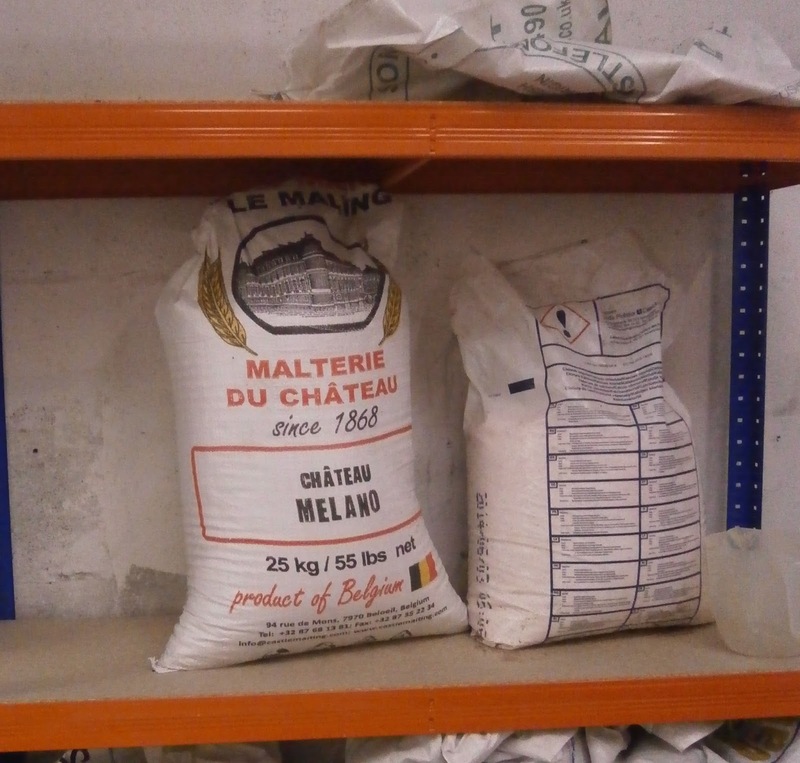 I once had the knack of pulling the rip-cord on these sacks of malt, but have lost it. Craig helpfully hands me a pair of scissors. It is an extremely basic brewhouse at Lawman. Craig’s mash tun is basically a simple metal vat with no hatch or any other mod cons. That means stirring the mash, by hand, A lot. 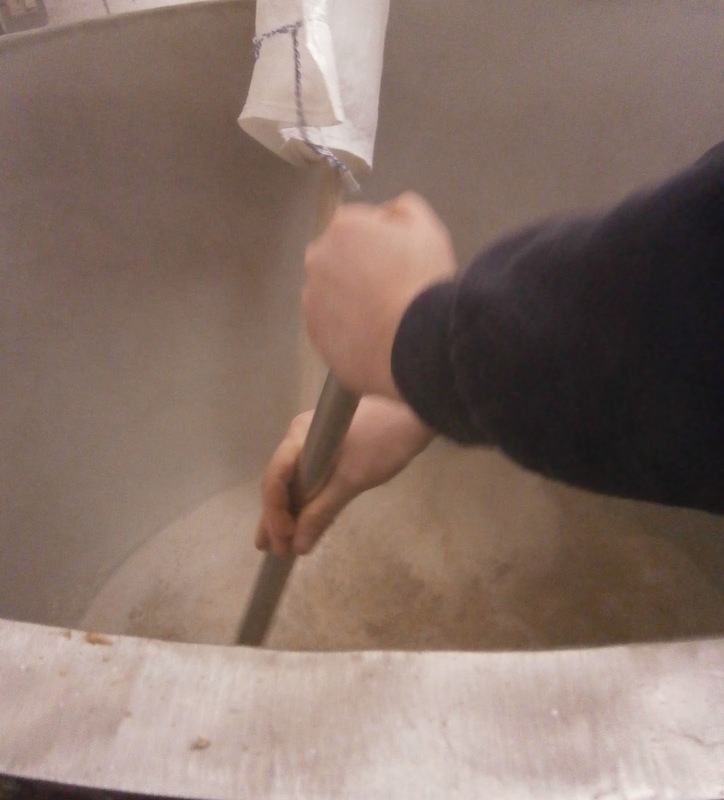 It also means that once the mash is done and run off, someone has to climb in and shovel out the draff. My turn. This is why I try to get to new breweries as soon as I can, before they expand: the smaller the brewery, the less mash I have to dig out. So I pull on my wellies and jump in … and immediately sink up to my ankles in the swampy, wet, very hot grain. Digging mash is hard on the back and the wrists (if you’re an unfit softy like me, at any rate), but you have a strong motivation to clear a space to stand in as fast as possible, before the heat around your feet and calves becomes unbearable. Back in the old days, when even big breweries had to do this by hand, whole teams of draff men would be in the mash tun, stripped to the waist and with wellies filled with cold water for protection. The newer beers too are still being developed: Pixel Bandit started quite dry and citrussy and has since become more full-bodied and tropical. Craig is enamoured of the effect of a small amount of Belgian melanoidin malt on the beer; less so of the effects of sudden changes to the mains water supply which led to unexpected problems with the beer. Obsidian is the occasionally produced, stronger, barrel-aged big brother of Stouty Stout (inevitably titled Stoutiest Stout). Craig acquired some rather unusual whisky casks thanks to connections in the whisky trade of his investors – by unusual, I mean from distilleries that have not previously made a habit of passing their casks on to brewers. The resulting beer is smooth and rich and I think the best thing Lawman has produced yet. When I tried the beer on draught at the Paisley Beer Festival last year, the first thought that came to mind was that if I had tasted it blind I would have guessed it to be from Harviestoun – that’s a compliment, by the way. Others agree, for the bottled version of Obsidian Imperial Stout went on to win the “craft beer” category in the Great British Food Awards, beating competition from Wold Top and Magic Rock. Not bad for a brewery less than a year old. Suspecting he was onto a good thing, Craig has roped in a well-known face on the Edinburgh brewing scene, Benji Bullen, a.k.a. Elixir Brewing Co, to help with the latest barrel-aging project.